The ASUS ROG Strix Z370-I Gaming is one of the major Mini-ITX options for Intel's latest Coffee Lake processors. 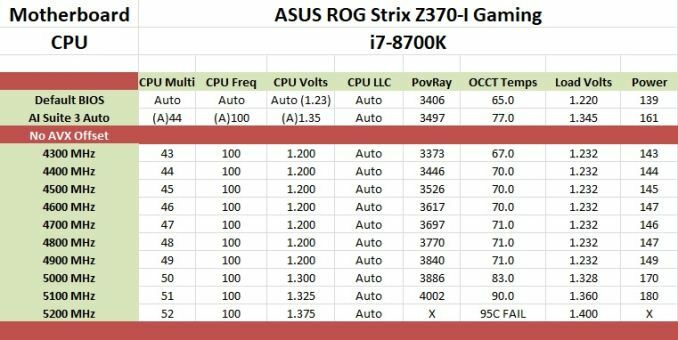 ASUS has a good history of building substantial Mini-ITX offerings, particularly with the ROG Impact line, however it is the Z-series mainstream Mini-ITX models that are the more cost effective option. For this generation, ASUS is combining dual M.2 slots, USB 3.1, EMI shielded audio and Wi-Fi on this small square platform. In this review we put it through its paces. The Mini-ITX space of the Z370 platform will typically attract users who want a powerful PC in a small package - a build will use a Z-chipset who also want to take advantage of some of the Z-exclusive features, otherwise the H-series is usually more cost effective. These builds are high-performance: almost going up to X299, but with fewer cores and higher frequency, or exchanging this for a quieter system. Board partners take notice of the markets, and each of the four major brands have at least one Mini-ITX offering. Potential buyers are looking for a combination of feature set, appearance, and performance, in order to choose the right board for their needs. 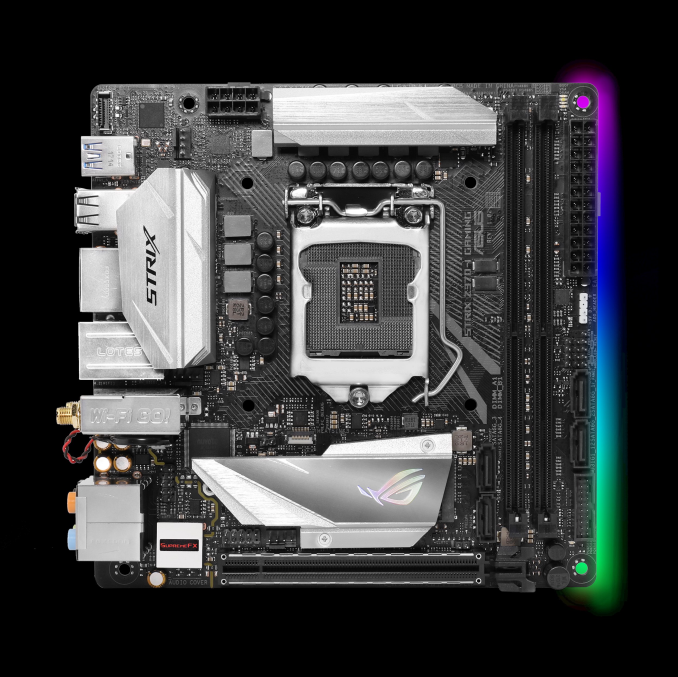 The ASUS ROG Strix Z370-I Gaming it built to support the flagship i7-8700K processor (including overclocking), has multiple M.2 slots, Wi-Fi, RGB LEDs, and delivers it in a 17cm square package. The Strix Z370-I Gaming performed admirably in all our tests scoring as good as any other motherboard in the CPU/GPU performance tests. As tested, the BIOS on this board comes with multi-core enhancement enabled out of the box, in a similar fashion to the others we have tested so far. As a result the system ends up running all cores at 4.3 GHz. For our system tests, the biggest win was in the boot time - as seen in older platforms, ASUS has the fastest booting board we have tested so far. The small board can do more than just boot quickly, however. In overclocking, we saw some impressive numbers. 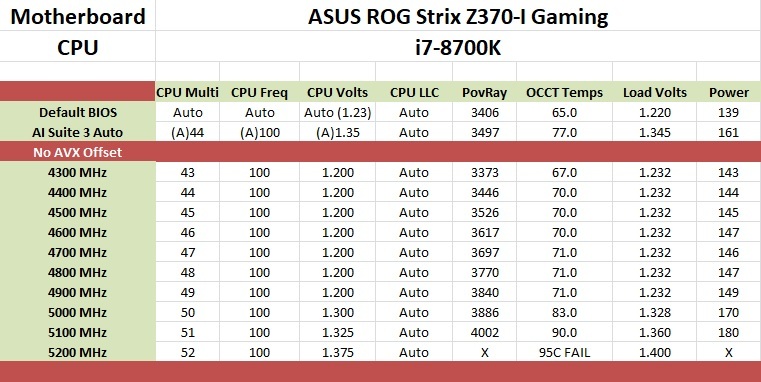 In our overclocking testing, as shown in the table above, the ASUS Z370-I Gaming is a capable overclocker, taking our i7-8700K to 5.1 GHz stable. The limiting factor here was our CPU temperatures, as the voltage was only slowly increasing still at 5.1 GHz. For automatic overclocking, the 5-Way Optimization process raised the all core boost to 4.7 GHz but added a -3 AVX offset (100 MHz over stock). Up to four cores were set for 5 GHz, which was a 300MHz improvement over its single-core boost of 4.7 GHz. The power delivery heatsinks, though not large, managed the heat loads without issue. While overclocking may not be a primary focus of a Mini-ITX sized motherboard, the Z370-I Gaming handled it with grace. For onboard features, the board manages to squeeze two M.2 slots in its small amount of real estate. The primary slot is located on the front of the board and shares a heatsink with the chipset. 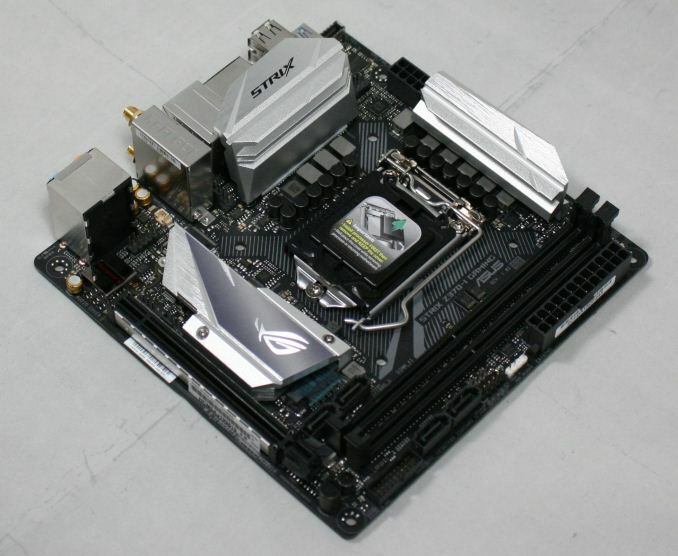 The other M.2 is on the rear, rather than a vertical M.2 slot which ASUS does on its larger motherboards. In addition for storage, the board has four SATA ports vertically oriented around the DRAM slots. For networking, ASUS chose an all Intel setup in the I219-V GbE and 802.11ac AC-8265 for Wi-Fi. The back panel IO gives users several USB ports - four USB 2.0, and four USB 3.0 - it is worth nothing that the Type-C connector isn't USB 3.1 (10 Gbps), but the board does have an onboard header for USB 3.1 though. Also on the back panel are Displayport and HDMI video outputs for using the integrated GPU. The audio stack uses an upgraded Realtek ALC1220A solution, has five output jacks, and a SPDIF out as well. Pricing on the Strix Z370-I Gaming comes in at $179 at Newegg. This price point puts it in the same price bracket as the MSI Z370-I Gaming Pro Carbon AC ($174), ASRock Fatal1ty Z370 Gaming-ITX/ac ($180), SuperO C7Z370-CG-IW ($187), with GIGABYTE's Z370N WiFi ($152) costing almost $30 less. "Also a mini-ITX board does not need to be used in a mini-ITX case." I'm not sure what one has to do with the other. One isn't paying a premium for the cooling, or less of it - that simply comes with the territory of the Mini-ITX board in general. I guess we can, or at least should, agree that there isn't a one size fits all and that Mini-ITX in general falls into the "not for everybody" category. Then again, If I built my wife a system in a mammoth full tower case, I'd probably be getting some very dirty looks to...so that is also a "not for everybody" sort of build.